The TOEFL is scored on a scale of 0-120. There are four sections to the TOEFL ibt, Reading, Listening, Speaking, and Writing, with each section worth a maximum of 30 points each. So, how is the TOEFL scored? Each section’s score is calculated differently. 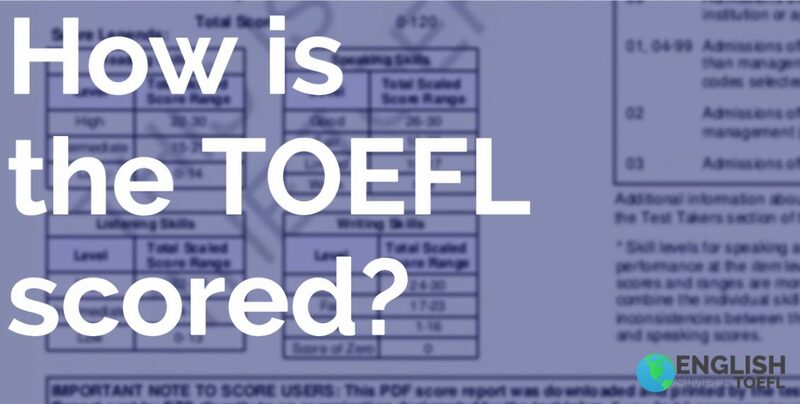 When you receive your TOEFL score report it will contain your total TOEFL score (out of 120) and four scaled scores for each section of the TOEFL. It will also include general feedback on what your TOEFL score means relative to your responses. How is the TOEFL Reading and Listening section scored? The Reading and Listening sections are scored by a computer. As the questions are multiple choice, the TOEFL Reading and Listening section are the most straight forward in scoring. You either select the right answer choice, or you don’t. 😉 Because of this, re-scoring is not an option for these sections. How is the TOEFL Speaking section scored? Because the TOEFL Speaking section is entirely based on recordings of your answers, it must be graded by a person. This means that the results and your score are based on a grader’s opinion of your response and how well it matches the ETS requirements. You can see the exact, official TOEFL guidelines and how they score the TOEFL speaking by clicking here. How is the TOEFL Writing section scored? This means that your TOEFL Writing section can also be submitted for review and re-scoring. To learn more about how to have your TOEFL Speaking and Writing scores redone click here. The TOEFL ibt scoring is done through a “centralized scoring network” administered by the main TOEFL ETS office, and conducted by a network of individuals in other locations, usually in their homes on their personal computer. Why does it matter how or who scores my TOEFL exam? This information means that the person scoring your TOEFL Speaking tasks and part of your TOEFL Writing tasks is human, and humans aren’t perfect 😉 Because of this, it’s important to remember that responses in the Speaking and Writing section require a strategy that appeals to a human grader. For example, if you’re not including an interesting “hook” in the intro paragraph of your Independent TOEFL essay task, you are missing a key opportunity to make a strong first impression on the reader. Also, with the TOEFL Speaking, beginning your responses using the English Simple “repeat strategy” gives the grader an immediate impression that you’re a strong English speaker. For more info on how to use this “human grader” strategy, check out the full English Simple TOEFL program.